To roast a juicy, succulent turkey, without using any butter or oil, soak your turkey in a brine bath overnight, you will never want to cook a turkey another way. Roasting a turkey can seem intimidating if you are doing it for the first time, but I can assure you, it is easier than you think! All you need is a little planning, room in your refrigerator, a probe thermometer, a turkey baster, a roasting pan (disposable one is fine) and you really can’t mess up. 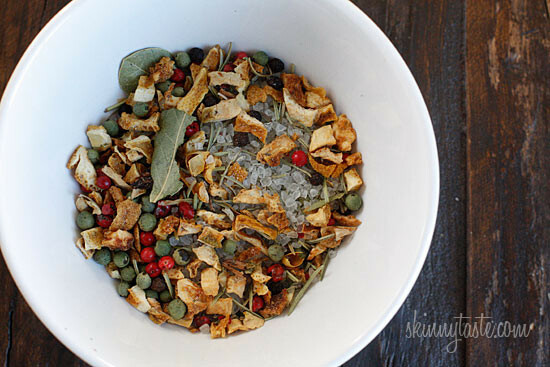 You can purchase a brining blend or you can easily make the brine solution yourself. This was simply a combination of coarse sea salt, cane sugar, lemon peel, orange peel, rosemary, pink, red and green peppercorns, thyme, sage and bay leaves. You can use a gallon of apple cider or vegetable stock in place of some of the water, the ingredients are pretty flexible. I’ve seen some brine combinations with cinnamon sticks, star anise, chopped apple, candied ginger, etc. Decide how many people will be eating, plan your menu, and gather your Thanksgiving recipes. Start using up the foods that are taking up space in your refrigerator and freezer to make sure you have plenty of room for your turkey, roast and other dishes you will serve. Check your pantry to see what you already have and make a shopping list of the ingredient you will need. Purchasing all your pantry items early will reduce stress later when the stores are crowded. If you don’t already have one, add a thermometer to your shopping list. A cooked whole turkey is safe at a minimum internal temperature of 165 F throughout the bird. 24 hours before you plan to cook your turkey, brine your turkey. To minimize cleanup, line a 5-gallon container with a large brining or oven-roasting bag. Transfer the turkey to the bag, add brining mixture, remaining water, and the other ingredients. Refrigerate for 24 hours, flipping turkey once. Estimate roughly one pound of turkey for each person for ample portions and leftovers. When should I buy a fresh turkey? You don’t want to buy a fresh turkey too early or it will spoil. The Tuesday before Thanksgiving is perfect. Some grocery stores let you call ahead to reserve your turkey. The safest way to thaw your turkey is in the refrigerator. A twenty pound turkey will take about 4 days to thaw. After it has thawed, it is safe for another two days. The night before you plan on cooking the turkey, remove the innards and rinse the turkey inside and out with cold water. Boil 1 gallon of water and brining blend for 2 – 3 minutes, remove from heat and let it cool to room temperature. To speed things up you can add some ice to it. Combine cooled brine with 1 gallon of ice water and submerge the turkey in the brine bath so that it is completely covered. I used a brining bag to do this, but a large container or a 5 gallon bucket would even work. Refrigerate overnight. 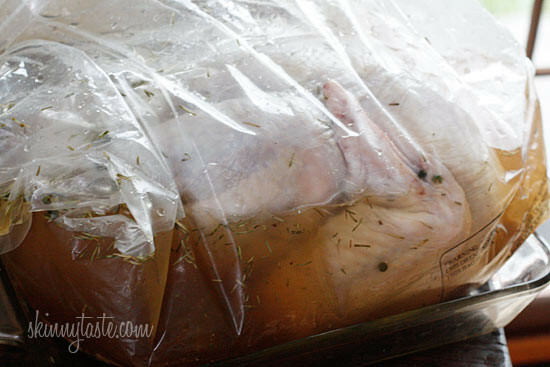 If your brine doesn’t completely cover the turkey, turn the turkey over half way through brining. Next day, an hour before you are ready to cook the turkey, remove the turkey from the brine and discard the brine. Rinse the turkey well with cold water and pat dry. Place in a roasting pan, I used a cheap disposable aluminum one to show you that it doesn’t have to be fancy. Let the turkey come to room temperature for one hour. Place the turkey, breast side up in the center rack on a flat rack in a shallow roasting pan 2 to 2½ inches deep. Roast in the oven for about 13 minutes per pound for an un-stuffed turkey, or until the internal temperature of the deepest part of the breast reaches 170°F. Baste the turkey with the pan juices every 45 minutes. When the thermometer reaches 170°F in the deepest part of the breast, remove from oven and let it rest for 15 – 20 minutes before carving. Can the turkey be cooked in a bake in bag? IS the thyme fresh or dry? How would this be if I left out sugar? The sugar is for flavor and to offset the saltiness. I like this roasted turkey. It seems delicious. There is no better way to cook a turkey, in my book. I use the apple sage brine. Cool technique! I'm making a turkey for this christmas and i want to know if after this process i still need to put the traditional herbed butter between my turkey's skin and flesh? I know it's a bit late but I am planning to brine my turkey this year. My turkey is about 6kg. How much brine should I use and does the water content stay the same?? I used this recipe last week for Thanksgiving. What a HIT it was!!!! This will be my Turkey recipe every year now. I didn't have a brining bag so I put my turkey in a cooler and left it outside overnight since it was cold enough outside. The turkey came out very moist and tastey!! This is the first turkey I ever brined and it was really simple and so moist and delicious. I omitted the citrus peel because I didn't want the citrus flavor, but otherwise I followed recipe and roasting directions. My turkey roasted in a about 1 hour less time which was surprising. I actually used a very large stock pot for brining, but I had only a 12lb turkey. Thanks so much for this recipe. Thanks for the info. First turkey for me, too. I'm kind of psyched, I even bought a brine mixture without even knowing if it only applied to deep fried bird! 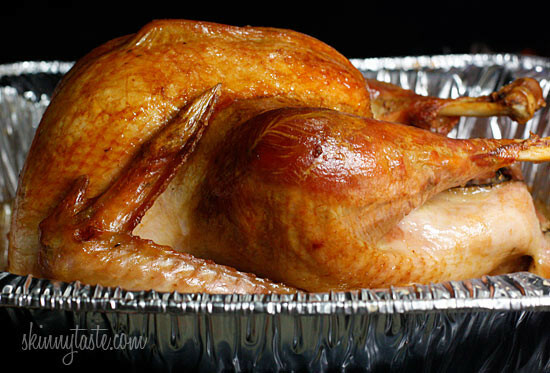 Do you recommend using foil when the turkey is being cooked, or a plastic turkey bag? Thanks. Do you put whole peppercorns in to boil the brine? Question – It will just be my husband and me for Thanksgiving this year. I am planning on cooking just 1/2 of a Turkey breast. Do I have to make all that brine or can I make a smaller amount? If so, does anyone have any recommendations? Thanks so much for ALL your recipes!! I made my first Christmas Dinner today for my inlaws! Brined turkey, garlic mashed potatoes, garlic and rosemary biscuits….all from your recipes! Thanks so much!!! Everything was a hit! I love brined turkey. It's the ONLY way I'll make one any more. Are you sure that you want the breast cooked to 175?!? That's 10 degrees more than USDA recommendations, and before the carryover temp would raise it even further. Made this turkey this year.. Also used my new electric roaster for first time. added a butter,kitchen bouquet, marinade over top before roasting so it would brown. Hubby went to carve turkey and there was no need. It fell apart. We made gravy with the drippings and it was divine. Will definitely make again!!! I'm so glad everyone enjoyed the turkey!!! Thanks Gina!! I made this to recipe yesterday and it came out perfect! The drippings did over-salt the gravy, so I won't do that again, but the turkey itself came out savory, moist and delicious. The only thing I think I would do differently next time is to boil the brining ingredients in a smaller amount of water because the gallon of water took a looooooong time to cool down to room temperature. Even w/ lots of ice cubes. 🙂 Thanks so much! Awesome, I am glad it turned out great! I had a "friendsgiving" on Monday. I'm on weight watchers so it was very important to me that each dish be homemade and weightwatchers healthy. I followed this recipe and I am just so happy with the results. It was just so flavorful and really made me look good as a first time turkey cooker! I posted the results and process pictures on my blog and gave you full credit! if you would like to see it let me know. I don't want to post a link so you know i'm not a spammer! I will definitely use this recipe again. Bring is easier than you think. Love the pickle bucket idea! Gina, is it necessary to use all three different types of peppercorns, or would the black suffice? Do they have different flavors? I've never used them before. I may have to try your brine spices one of these days. I've brined our turkey for the past 4 years or so. I refuse to cook turkey any other way. Dried out turkey is a thing of the past. I have brined our bird in a super deep stock pot, as well as in an igloo cooler when the bird was too big to fit in the stock pot. For anyone needing a food-grade bucket, Firehouse subs sells their pickle buckets to the public for $5 and always have them. Check online to see you have one nearby. I really appreciate all the comments, they are so helpful to all! I haven't grilled a turkey, but it sure sounds like it would be good! i brined and grilled my turkey last year and it was delicious! i had to rig up my grill a bit to fit a smaller rack over coals to catch drippings, but it worked. the turkey was juicy and flavorful and cooked faster on the grill than the oven- cut about an hour off, i think? AND- so nice that it freed up my oven! i am planning on that route again this year. Lisa, I think as long as you rinse the bird, inside and out really well it would be ok, but I would use less salt when making the stuffing. If you use a Kosher Turkey (Empire is my favorite brand) you don't need to brine them. I season my turkeys with equal parts of garlic powder, onion powder and paprika mixed with water to make a paste. Then I top the turkey with a can of mandarin oranges and a small can of crushed pineapple. Make sure you use all the juice!Delish! I am a novice turkey cooker as well…can you stuff a turkey after you have brined it? I was hoping to do both..but not sure if it will work? Thanks to you, I'm going to give brining a try this year. Also, appreciate the tips your commenters have offered especially about the gravy. Lois, yes you should put the turkey on a rack, some of those disposables are elevated with a built in rack. Jan B, the salt is a must in the brine, otherwise it is not a brine. You just need to rinse the bird well before you cook it. I'm sure cutting the amount of brine would still work out. Susan, I have not grilled or smoked a bird, hopefully someone can help here. Peanutbutter, buy the bags too! I didn't use the whole jar of brine, I used about 3/4. Tracy, no I cooked it uncovered. Do you cover the turkey with foil while it cooks? This sounds delicious. Funny, I never knew how to brine a turkey, since it's earl enough, I think I will try this. 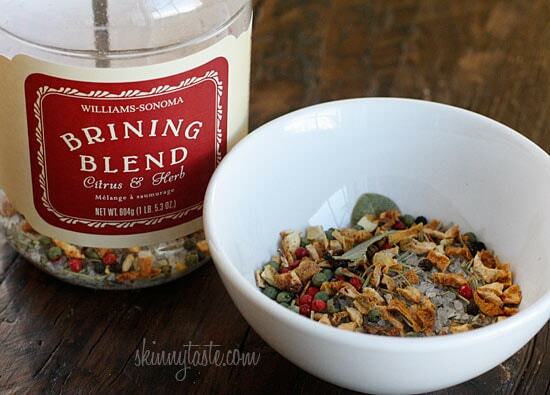 I'm heading to Williams and Sonoma today so I'll pick up some brine. Thanks for the recipe! It is funny that I bought the Brine and bags from William Sonoma before you had even tried this,so I am excited to know it was good. They highly recomended it,but you never know. I am a sucker for buying things to try. I brined last year and the turkey was absolutley delicious! I did buy a bag from another store and I woke up to brine all over my kitchen floor. Wishing I had stuck with the bucket method. Needless to say I Wasn't going to do a bag again, but Williams Sonoma guarenteed it. Of course they won't be there for the clean up.haha Looking forward to trying some of you other recipes for Thanksgiving! Thanks for keeping me on track. Enjoy and Happy Thanksgiving! We have been brining for several years now. It definitely makes a difference in the moistness of the bird. We have used a brining bag and a roasting bag. Both seem to work equally well. Typically, we pour the brine over the turkey in the bag, put in an igloo, then cover with ice. I keep it in the kitchen until the next day when it's time to roast. I have two ovens at home, but this year I'll be making Thanksgiving dinner in a cabin where there's only one oven. We do have a large smoker, however. Can someone give some instructions on how to grill or smoke the bird? I'm not worried about the gravy because I'm planning on making it ahead of time this year. I read a recipe for make-ahead gravy in Bon Appetite. Last year I had a major gravy debacle on Christmas. Thanks for developing this site, Gina. It is the best on the web, in my opinion. I boil the giblets for gravy and then only use a bit of the fat from the turkey broth. The gravy can be salty otherwise. I use low sodium organic broth as well. Organic has much less sodium then regular low sodium broths. You can always add more salt if you need it. thanks for the great idea! Can you brine the turkey in one of those oven bags? and i'm wondering if I can substitute kosher salt with regular salt? Grilling sounds like a great idea. We have a gas grill on our apt building rooftop. do you just set the whole unstuffed bird on the grill? but then there would be no drippings for making gravy. Also, does anyone know how long a "fresh" and unfrozen, unopened turkey lasts in the fridge? I bought mine yesterday and it's in the fridge right now.. the expiration date on it says "sell by 11/28/11" I'm assuming it will be okay. Thanks for all the great recipes Gina, l love your site! 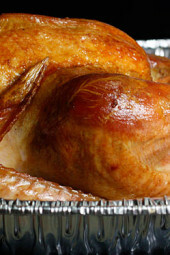 If you are using a frozen turkey, it's been injected with a sodium solution to help is freeze. This can result in very salty turkey. SO if you brine, when your finished rinse your turkey really well, and soak it for 15 min. in cold water. Rinse again. Also when you make your gravy from the pan drippings use organic low sodium broth because it has less sodium than regular low sodium broth. You can brine chicken, pork, or shrimp even. The brine solution would vary. Wendy, I don't see why you couldn't brine a frozen turkey, as long as it wasn't brined or in a salt water solution. I would just make sure it was defrosted first. I did some research myself and read several people had success doing this. Annie, yes it can make it salty, what I did was pour my juices in a gravy separator to remove some of the fat, then I used part of the pan drippings with some chicken broth and a little water, it was delicious!! Brined is the best. We don't have room in the fridge either. I put mine into a cleaned 2 1/2 gallon bucket I get from the doughnut shop then pour the brine in it to cover. I set the bucket in a large cooler then fill with ice to keep it cold and keep draining/adding ice as needed for 2 days. After 2 days, it's off to the smoker! Can you make gravy from the juices of a brined turkey, or will it be too salty? Yes, you can, just don't add any more salt. I do this evey year. I read somewhere that the only turkeys you should brine are fresh turkeys from the farmer. The frozen ones you get from the grocery store aren't the right ones. Is this true? Ive brined "butterballs" from my supermarket and they always turn out great. would this work on a chicken? Delish! I love to brine and then roast the turkey breast side down. The gravity goes to work and it is the most moist breast you will ever have. The skin does not cook up crisp, but then there is no temptation to eat it. Thanks for the heads up Gretchen!! Brining will not effect the points. Oh, and just FYI: any turkey that you find in-store that says "kosher" will likely be pre-brined as well. I'm DEFINITELY going to try this. I love the way the saltiness gets into the meat and makes it so tender and juicy. Brining is the ONLY way that I cook a Thanksgiving turkey. The meat is SO flavorful, SO moist (heh), and it is SO hard to screw it up. I'm never going back! YUMM! Thank You! Is it about 1point+ for 1oz of turkey? Does the brining change up the points? I had my brother and sister in alw over to help us eat it, everyone loved it!! LOVE THE IGLOO IDEA!! I have a second refrigerator, but this was a small bird. Some birds come brined, so check to see you aren't over brining. Sounds delicious w/o the unhealthy fats. The only turkeys that I have been able to find at the store come already in some sort of salt solution….Can you still brine these? Or are they basically already brined?? Who has that much room in their refrigerator at Thanksgiving – especially if you have a 18+lb turkey?!? I've been brining mine for years, but I usually double the original recipe and brine in an igloo cooler outside (we live in MI, so it's plenty cold outside). Works perfectly, and frees up the refrigerator for all the side dishes I make the night before. (My recipe calls for dissolving the sugar/salt in a small amount of water (1/2 gal or less) and then adding ICE WATER into your container after the mixture fully cools). I also do mine in a cooler and I live in Cali!! I'm brining this year and we have a giant 25 lb bird… I stuffed him in a bucket, filled with brine and ice, and put him in the garage. So far, so good! I do and I live with 5 other adults. I've been brining my turkey for the past five years or so, and I'll never do it any other way. I also grill it outside to free up precious oven space. I use an apple cider brine, and stuff oranges in the cavity while it's brining. I can attest to the juiciness…last year, my husband had the grill WAAAAAAAAAY too hot, and pretty much cremated the turkey. It was absolutely black, and finished cooking in…get this, FORTY-FIVE MINUTES. lol I thought the bird was done for. Wrong…We let it sit for a while, cut into it, and found the inside to be perfectly done. As long as we trimmed off the charred outside, it was delicious. Sorry if this is a Really stupid question, but do you peel the oranges & how do you determine how Bengt to use? after five years in a brine doesn't it eventually just turn it into a meat like prosciutto? This is perfect!! Thanks for sharing, you make it look so easy. And it looks delicious!